Aloe Vera Moisturizing Shampoo by Nature's helped grow back the hair in a bald spot that I had. It smells nice! Love Aloe Vera+Macadamia Oil Moisturizing Shampoo by Nature's Gate, leaves my hair very soft and smells good to. Aloe Vera + Macadamia Oil by Nature's Gate is a great product for a great price. Smells amazing and leaves hair feeling smooth. Nature’s Gate‚ a trusted alternative for healthy hair. Your cleansing routine just got more responsible. Aloe Vera + Macadamia Oil Moisturizing Shampoo gently cleanses hair with a unique blend of Aloe‚ Macadamia Oil and Pansy. Ideal for dry/coarse Hair. Water (Eau)‚ Cocamidopropyl Hydroxysultaine‚ Sodium Cocoyl Isethionate‚ Disodium Cocoamphodiacetate‚ Lauryl Glucoside‚ Glycerin‚ Aloe Barbadensis (Aloe vera/aloès) Leaf Juice‚ Panthenol‚ Macadamia Ternifolia (Macadamia) Seed Oil‚ Simmondsia Chinensis (Jojoba) Seed Oil‚ Borago Officinalis (Borage/bourrache) Seed Oil‚ Tocopherol‚ Ascorbic Acid‚ Urtica Dioica (Nettle/ortie) Extract‚ Persea Gratissima (Avocado/avocat) Fruit Extract‚ Viola Tricolor (Pansy/pensée) Extract‚ Ascorbyl Palmitate‚ Polysorbate 20‚ Leuconostoc/Radish Root Ferment Filtrate‚ Hydroxypropyl Methylcellulose‚ Sodium Hydroxide‚ Phenoxyethanol‚ Glyceryl Undecylenate‚ Citric Acid‚ Fragrance*. Massage a generous amount of shampoo gently into wet hair and scalp. Work into rich lather. Rinse thoroughly. For best results‚ follow with Nature’s Gate Aloe Vera + Macadamia Oil Moisturizing Conditioner. May be used daily. 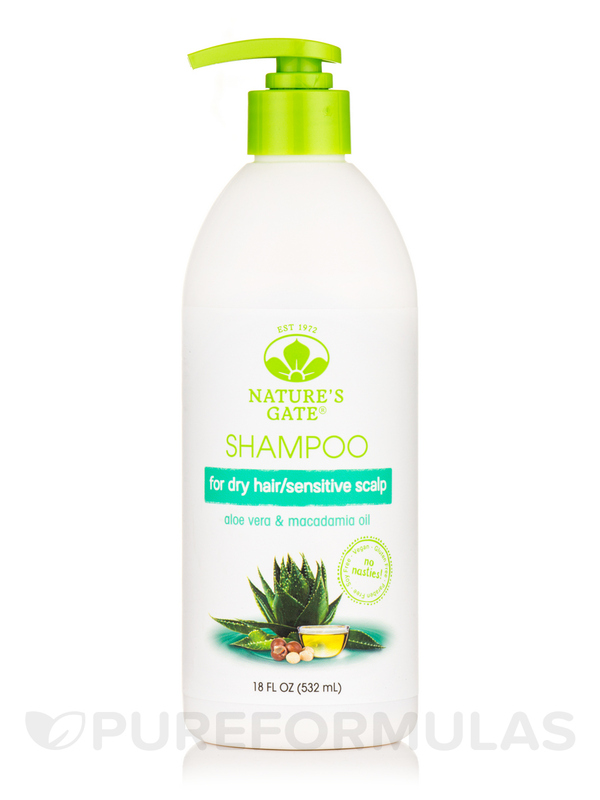 I had been using nature's Gate Shampoo throughout the year but once it started getting cold outside, my scalp started itching. This is usual with me. The dry cold air does that so I bought Nature's Gate Aloe Vera & Macadamia Oil Shampoo to help. The next day after using this shampoo I noticed the itch was gone. Its had a wonderful fresh scent and leaves my hair light and shiny. Like that it lathers up alot. I bought Aloe Vera + Macadamia Oil Moisturizing Shampoo Nature's Gate to try out and it is way too oily and left my hair limp and oily. I cannot even use it. Smells nice and is all natural. I bought Aloe Vera + Macadamia Oil Moisturizing Shampoo by Nature's Gate for my son who has a dry scalp . It seemed to improve the overall health of his hair. Aloe Vera + Macadamia Oil Moisturizing Shampoo by Nature's Gate has changed my hair. It is so amazing and smells wonderful. Don't hesitate on this one! You won't regret it. The smell lasts all day, it made my hair strong, & thick. Aloe Vera + Macadamia Oil by Nature's Gate was okay. Nothing really exceptional about it. I generally wash my hair every day and Aloe Vera +Macadamia Oil by Nature's Gate doesn't dry out my hair. It also smells nice and leaves my gray hair shiny and manageable, not limp or wispy. Smells nice, non-drying, good for daily washing. I have oily hair, which I am sure you've heard is actually a symptom of dry hair: Typically, the shampoo you?re using has harsh detergents in it that dry out your hair, and your hair overcompensates by producing excess sebum. Makes sense, right? However, every hydrating shampoo I?ve ever used has weighed my hair down and made it oilier. Aloe Vera +Macadamia Oil by Nature's Gate is an exception. It makes my hair feel clean but not stripped, hydrated but not weighed down. What?s more, PureFormulas sells this product at a dang good price with free shipping. No kidding, free shipping on all orders. Thanks Pure Formulas. Leaves hair feeling clean and hydrated. Does not weigh down hair. I always use a little conditioner with this. You may want to consider that. I've been using this line of hair care for a couple decades now, and don't think I'll stop any time soon! Aloe Vera + Macadamia Oil by Nature's Gate has a light, pretty fragrance and rinses clean easily. I use it on color treated hair. Light fragrance, easy to rinse, hair feels clean afterward.